When Joe Shuster and Jerry Siegel created the Superman character in the 1930s, they were still living at their parents’ homes. 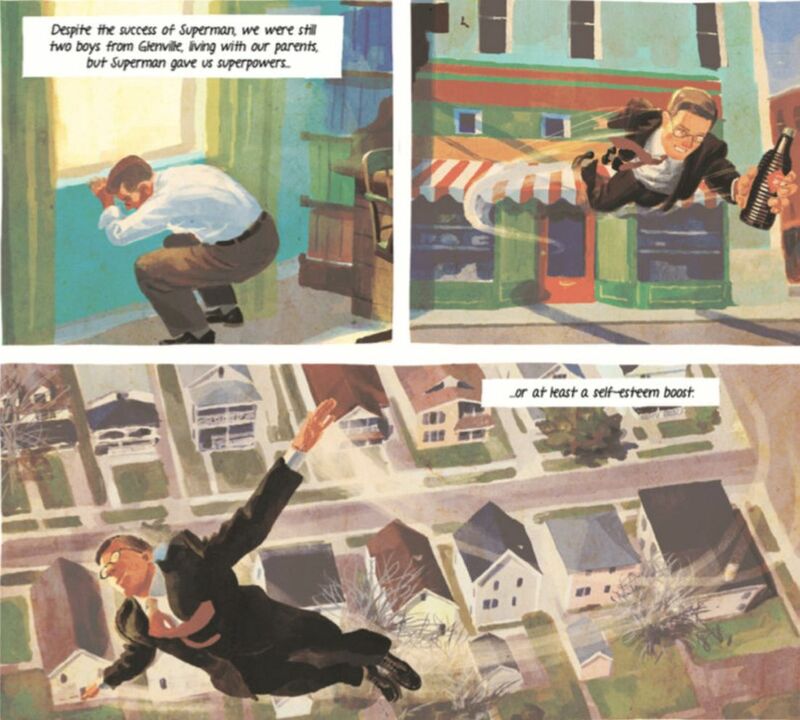 Of course, the character and his story – the arrival from another planet, his dual identities as mild-mannered reporter and flying, bulletproof crime fighter – would go on to change the comics industry in several ways and pave the way for the super-heroization of our popular culture. So Jerry and Joe are both nerdy outsiders, and that’s how they meet at school. But was their shared Jewish immigrant background also a big part of their coming together? As in, they weren’t just nerds, they also weren’t as assimilated as the other kids? Voloj: “They definitely shared a very similar identity, both born to Eastern European Jewish immigrants – Jerry in Cleveland, Joe in Toronto – but their identity was also the identity of Glenville, the neighborhood they grew up in. 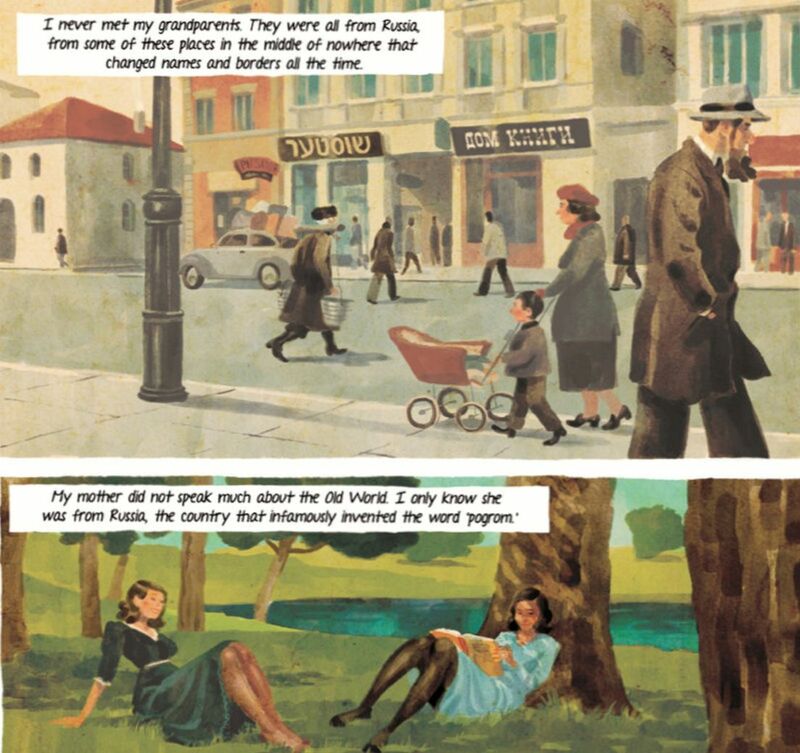 Jewish identity in America before and after World War II is a recurring theme in the story, but it also feels like 99 percent of the characters in the book are Jewish (from the businessmen to other artists like Stan Lee and so on). Could you give an idea of how Jewish the comic book industry was throughout those early decades and why that might have been? “It’s a history with many parallels to the beginning of the American film industry. Jews were discriminated against on the job market. If you were a writer or illustrator, not many jobs were available if you could be identified as Jewish. Some Jews changed their name and hid their identity in order to seek employment. Jewish artists such as Jakob Kurtzberg or Stanley Lieber became Jack Kirby and Stan Lee [respectively], even if they often claimed that their name change had nothing to do with them trying to hide their Jewish background. “When, thanks to Superman, comics became a lucrative industry, job recruitment in this new market happened by word of mouth. Friends and family were hired. That’s why, for instance, many comic book pioneers came from even the same high school, such as DeWitt Clinton in the Bronx, where pioneers such as Will Eisner, Stan Lee or Bill Finger, to name but a few, had been students. Was it an easy decision to tell the story from Joe’s perspective? Was it solely because he’s just a more likable character than Jerry was? “When starting my research, the plan was to write about both of them from a third-person perspective, but then Joe became the protagonist by chance. 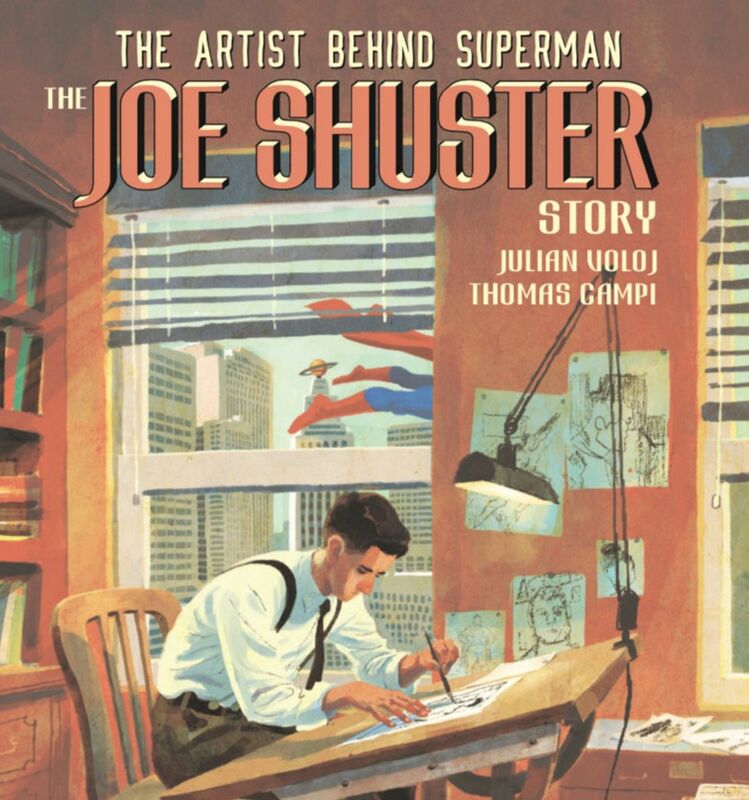 In 2014, I learned that Columbia University had just received a donation of letters and documents that were either written or once belonged to Joe Shuster. I contacted Karen Green, who oversees Columbia’s comic collection, and even before the documents were cataloged, I got access to these letters, legal papers, bills, etc. “It was fascinating to read about Joe’s problems in his own words. Most of the documents were from the late 1960s, during a time when [he was under] the threat of eviction, had doctor bills piling up, etc. – while at the same time preparations were made for a multimillion-dollar Superman movie. “It also became apparent how Jewish he was. For instance, he wrote about the tzedakah he gave during the good years and how ashamed he felt that now he needed help from the Jewish community to pay his own bills. “Jerry had always been the dominant figure of the creative duo, with Joe being the silent partner following his lead. Were there other Jewish comic book artists and writers who dealt with similar losses of rights to their creations? Batman co-creator Bill Finger seems to be one? Or were Shuster and Siegel really the worst case? “I’m not sure if it is really the worst case, but I would rather call it the original sin. “Many stated that Siegel and Shuster were naive to sign the first Superman contract, but as we show in the book, there was no precedent. Comics were not big business and most work was work-for-hire, transferring rights to publishers. “And then Superman changed everything. No one expected this success – neither the creators nor the publishers – and for sure no one expected the success to last. “Like Superman becoming the blueprint for the genre, Siegel and Shuster’s contract became the blueprint for other contracts. “Many pioneers experienced similar fates. Batman co-creator Bill Finger [who was Jewish], subject of a future graphic novel project I’m currently working on with the Israeli artist Erez Zadok, is another tragic story that only recently had a posthumous happy ending thanks to the efforts of comic historian Marc Tyler Nobleman. People have called Superman, who is sent away from his home planet just before it is destroyed, as the ultimate immigrant character. Was this definitely part of Siegel’s thought process in creating him? And can Superman more specifically be compared to a Jewish refugee fleeing a burning Europe? “Superman’s Jewish identity is a recurrent theme. I once read that his origin story is an allegory to the Kindertransport, but this is, of course, a post-Holocaust analysis. “Both their parents escaped poverty and pogroms in Eastern Europe, so this could have influenced the story, which some see as a kind of modernized Moses tale. “I’m neutral when it comes to these interpretations. Superman’s origin story, which we see developing throughout the graphic novel, had many roots for sure, as did the plot. The double identity came from Zorro.